An ideal research paper should be 25-50 pages long. If it is for a journal then it may be 9-12 pages long. Usually international conferences state how many pages are allowed. A paper needs to adhere to the page setup guideline stated by the conference technical committee. So the paper should be prepared in that way making sure that the top and bottom margin, the left and right margin, the column width and the column separation are as per the instructions. Wrong page setup can waste valuable space. The paper will have several sections. First comes Abstract. In abstract the summary of the whole paper should be stated in a few sentences (not more than 4/5 sentences). This includes why we do it and what we propose. The abstract is the first place people look at when reading your paper. Therefore the abstract should have strength and punch, to draw the attention of the reader, and make him interested to read your paper. Incidentally abstract has no section number. Then comes the 1st section which is Introduction (I. Introduction). The first paragraph should state what the problem is you are dealing with and its effect on real world events. That is you basically highlight the problem to the interested reader. Then the 2nd paragraph should state what your contribution is. It should be original. The paragraph should explain as briefly as possible, how your proposal solves the problem mentioned in paragraph 1. Remember the most important thing about introduction or any section of the paper is that it should read smoothly. No bad english, there should be a certain flow to the way it reads. A well written introduction always makes a good impression on the reader. Then comes the section where what other people have done is stated. it is called related Work. here you state what other people have done in the area of the problem. Have their proposals been able to solve the problem? If not why? What are the shortcomings of their proposals in the area of problem stated? This section highlights the extent of the other people’s work and convinces the reader that indeed the problem is worth working on, and the author must have done something special to solve this problem. It is key to the success of the paper…..how you compare other people’s work and show that they have not been able to solve the problem. Therefore a thorough literature review needs to be done….up to current year. A lot of studying needs to be done to successfully carry out this section. Once you have identified the failing of other proposals, its time to offer your solution. So the next section should be termed as “My Proposed algorithm or solution or something similar” (III. Proposed Recursive Digestive System with Feedback). The title of this section should be impressive to show that yes, significant contribution has been made by the author of the paper. And in this section you explain your proposal. Figures should be included to clarify the proposal (pictures tells a thousand stories). The proposal should be written in such a way with equations and figures that a reader can understand what you are talking about. However since it is a conference paper, then a lot of impressive jargons need to be used to impress the reader. if it was a tutorial sort of paper then more tutorial type discussion would have to be included. You have to state how the graph or chart was produced. What sort of assumptions were considered. What do we conclude from the graph or chart? Does the performance degrade at any point? Will it hold for all types of assumptions etc. etc. This section is the key in getting ur paper accepted. This section tells the reviewer that what you say is not garbage, but you actually have evidence to support your claim. Then comes the section with Conclusion. In this section you again have to explain what you have done, why you have done it, and does your proposal make any difference to the issue in question. Then end the paragraph with a parting line. The conclusion should also be written in concise format, crisp and not more than 5/6 lines…well you can change that depending on the amount of material you have to discuss in the conclusion. Once you have done all the above, that should make the paper quite interesting and you should not have much trouble getting it accepted. By the way, some form of mathematical analysis of you proposal in section III will also help ur paper significantly during the review process by the conference technical committee. 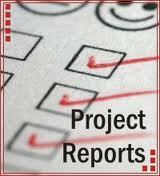 Hope you now have a better understanding of how a project report is written.